About 90 % of what I read I read for review. Taking a book off the shelf of my personal library feels wrong. Rebellious. Even defiant. 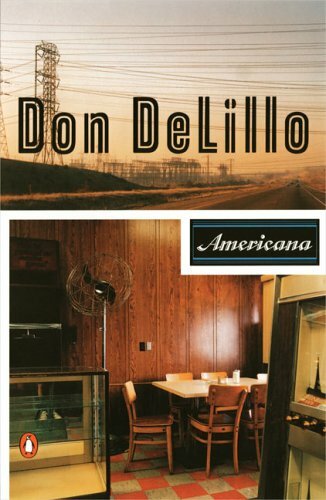 Today I decided to go against my personal belief system and grab randomly, choosing a Don DeLillo novel called Americana, to read alongside the books I'm working on for review. There was no one in my bedroom with me, still I looked around, shifty eyed and furtive, before grabbing it and fleeing downstairs as if demons were nipping at my heels. Sad, really, worrying Bradbury's firemen are going to come torch my house for reading a forbidden book, one purchased with my own money and not sent by a publisher, marketing agent or the author him or herself. But it's been so long since I connected books with pure pleasure, and not – to some extent – with work. I'm not saying I don't enjoy reviewing. I love it. It's just when you read for review you have to keep an eagle eye out for certain things: character names, descriptions, professions, defining characteristics and motivations; all major plot points and twists; authorial style; etc. There's not as much fluidity to it, not nearly as much luxury to just let the story flow, forgetting the outside world exists. Because when you review you have to keep a pen handy, or highlighter or whatnot, and if you're like me and don't see the physical book as a sacred object (it's what's inside that counts, as they say when trying to get a friend to date someone with a "nontraditional" outside, hiding a kind heart), you write all over the damn thing: underlining, bracketing, filling the margins with asides. Maybe that explains the extremity of my anger when an author takes me out of the story via bad prose, the dreaded overuse of adverbs, the word "that" when not strictly necessary, and the ultimate sin, telling and not showing. Though I can fall partially into a well-written book, it's the same as life after you've had children – one ear is always attuned to the clarion call of distress. I'm on the edge already, reading your book with half my brain, keeping the other half in critical mode. Yank me away from the magic and you drop half a star rating. So will I be able to fall into Americana without my right hand itching for a pen? Doubt it. Because I'll probably want to share what's glowing about the prose, why Don DeLillo is one of the best. Not the worst problem a person can have, and no complaints here re: the pleasure of my various writing gigs, being paid to alternately rant and rave high on my list of delights. "Then we came to the end of another dull and lurid year. Lights were strung across the front of every shop. Men selling chestnuts wheeled their smoky carts. In the evenings the crowds were immense and traffic built to a tidal roar. The santas of Fifth Avenue rang their little bells with an odd sad delicacy, as if sprinkling salt on some brutally spoiled piece of meat. Music came from all the stores in jingles, chants and hosannas, and from the Salvation Army bands came the martial trumpet lament of ancient Christian legions. It was a strange sound to hear in that time and place, the smack of cymbals and high-collared drums, a suggestion that children were being scolded for a bottomless sin, and it seemed to annoy people. But the girls were lovely and undismayed, shopping in every mad store, striding through those magnetic twilights like drum majorettes, tall and pink, bright packages cradled to their tender breasts. The blind man's German shepherd slept through it all." One paragraph and I've decided he's worth every minute of review truancy. If I'm going to go rogue I may as well choose something with this much grace and beauty. Makes me feel better about taking a detour, remembering it's more about the journey than the destination. I give myself permission to commit this "sin" again, because to do otherwise would slight the library I've so assiduously built up. I don't really want to do that. I shouldn't have to do that. So, you know what? I won't. Rebecca, just be really choosey (is that a word? ), and books you didn’t request you don’t have to review. Also books you just cannot read, for one reason or another. A lot of my reviewing’s for print publication now, in the library field, but being the book nut I am I accept soooo much. Previous Post But does he purr more loudly than my husband snores?